First let me define what I mean by “old.” In some regards I am referring to age, considering an overwhelming majority of the Presbyterian Church U.S.A. denomination is . . . well, old. However, I am also referring to one’s longevity and history with this particular denomination as well – cradle Presbyterians, Presbyterians that are 3rd, 4th, 5th generation, Calvin enthusiasts, and those who can speak in acronyms. I write this letter to you from me, who I consider to be somewhere in the middle. Now, while I do speak fluent acronym, I have only been Presbyterian for 14 years. And while I have done a lot in my short Presbyterian life, I am also aware that I am a year away from entering into what I call the limbo phase where according to my denomination I will no longer be considered young, but not quite there to being considered old. I’ll be somewhere in the middle. So as I enter into this “middle” zone, I want to share my observations of General Assembly from a very particular lens. This passage was the theme of this year’s General Assembly (GA). What is encouraging about this passage is that it speaks of God’s incredible unending reach that is able to revive the tired and give strength to the hopeless. What is sobering about this passage is the reality that even the young get tired and weary. It’s not just the old. That’s what I saw at this year’s GA. While the “old” were debating and swimming in the pool of parliamentary procedures, what I saw from the “young” (those in age and new to the denomination) was a sense of weariness. Those of us who have been playing the game long enough have an understanding that endurance and patience are highly needed skills if one wants to “survive” in this denomination. But that isn’t the type of weariness that I saw in the “young.” They weren’t out of breath; they weren’t impatient; and they weren’t even naive to “how the game is played.” The kind of weariness that I saw was a sense of being fed up and a questioning of whether this was worth their time. Please hear me when I say that I am not only differentiating between age, but also those new to the denomination or faith for that matter. If this denomination is shrinking, it is not just because of age, but because there is not an increase of those flocking to become Presbyterian. And while there are many arguments about being post-denominational; being spiritual and not religious; and the realities of living in a multi-faith society, I am not addressing that. I’m talking about the current couple million Presbyterians that already exist today. I just returned from preaching at a conference of 700 middle schoolers. It is quite an experience to witness 700 middle schoolers singing to Justin Bieber’s “Baby, Baby, Baby, Oh.” But I digress. It is also quite an experience to be surrounded by this particular age group. Some are still fully planted in their childhood, playing with dolls and toys. Some are in the full stages of puberty and wafting through the drama of relationships and break-ups. What is great about this age is that they have all the hopes that “the sun will come out tomorrow” mixed in with the experiences that “reality bites.” It’s a fragile age. It’s a tender age. But it’s also a most hopeful age. The theme of the conference was “Rooted in Love” from Ephesians 3. The words “I kneel before the Father” gives us a sense that this is a prayer between God and Paul that is intended for us to overhear. If we listen closely, eavesdropping on Paul’s prayer, we overhear Paul’s focus and concern is the community – not individuals, but us as a faith community. Paul clearly knows that it is not easy to live and exist in community. God calls us into community and it is by the power of God, Jesus, and the Holy Spirit that keeps us in community. As Christians, as Presbyterians, we are blessed with each other and we are stuck each other. It takes work to be in community because we are just as territorial and opinionated as anyone else. Paul’s prayer suggests that progress will be slow to grasp Christ’s love, live into the fullness of God, and tap into the power of the Holy Spirit that is beyond our imagining. A community rooted in love can last for all generations. This got me thinking . . . what would be my prayer to God for this particular community? And who would I intend to overhear my prayer? And that’s where this open letter comes in. When I preached at the middle school conference, I told them that they are not the future of the church. They are the present. They are the now. However, after witnessing what I saw at GA, I feel that I may have lied to them or set them up to believe something that is not true. Because for that statement to be true, the “old” needs to make room for their voice and share power of decisions and influence even when it is uncomfortable. Normally, when I say this, the “old” feel quite threatened. But I am not making an either/or suggestion, but a both/and. We who are “old” and in the “middle” have a responsibility to the “young” and we have been slacking and doing them a disservice. If we look at our denomination shrinking, we are fooling ourselves if we do not take responsibility for our own participation in that downward trend. We extend a special welcome to those who are over 60 but not grown up yet, and to teenagers who are growing up too fast. We welcome soccer moms, NASCAR dads, starving artists, tree-huggers, latte-sippers, vegetarians, junk-food eaters. We welcome those who are in recovery or still addicted. We welcome you if you’re having problems or you’re down in the dumps or if you don’t like “organized religion,” we’ve been there too. If you blew all your offering money at the dog track, you’re welcome here. We offer a special welcome to those who think the earth is flat, work too hard, don’t work, can’t spell, or because grandma is in town and wanted to go to church. We welcome those who are inked, pierced or both. We offer a special welcome to those who could use a prayer right now, had religion shoved down your throat as a kid or got lost in traffic and wound up here by mistake. We welcome tourists, seekers and doubters, bleeding hearts … and you! What would it look like if we approached everything we do with a sense of hospitality – not just in worship, but also in the decision-making of the church. Hospitality is less about who we are welcoming and more about examining what barriers we create that are unwelcoming. It causes us to question what needs to change in structure and process that doesn’t translate to those who are not on the “inside” of our denomination. When my committee (Committee to Review Biennial Assemblies) suggested a way to increase commissioners who were 35 years old and younger, one of the responses we received was why we chose to focus on age and not any other diversity category such as race or gender. My answer is that age disparity is an issue for all, whether it is GA, conferences for people of color, peacemaking, liberal or conservative. I’ve been to many conferences and I’ve been a part of many different groups and all struggle how to transform what they do so that it is “attractive” and inviting for younger participants. Hospitality is not enough. We have a responsibility to nurture them. The kind of wisdom we can pass down is a sense of rootedness, perspective, and experience. But we need to be nurtured as well. We are living in a different world. Let’s get real, we are not in a position to figure out on our own how to engage in this world, be relevant in this world, and know how and what needs there are to be addressed. We are in this together and we should be nurturing each other as we continue to live into the ministry God is calling us to. I honestly think this is the hardest part of living in community with one another. This is when we as a community can get territorial – nurturing the other to fit into our community when really we all need to be open to compromise, experimentation, failure, and success. One of the critiques my committee hears when it comes to younger folk participating is whether they are wise enough. My answer is “it depends.” Certainly, I am a little weary when a Young Adult Advisory Delegate has an opinion that affects my pension, but to say that the “young” does not have wisdom on how this denomination is to respond and engage in world issues or matters that affect change in this denomination makes me wonder if those who respond that way actually talk to any. If we have successfully welcomed and nurtured, then they must be given opportunities to influence, change, and lead. They must be more than bystanders and advisory delegates. If we want the “young” to stay in this denomination than what better way than giving them a say in the future of this denomination. At best, we as Presbyterians will be better off for it. We will be exposed to ideas that we never thought of before. At worst, they will leave and share their innovative ideas, talents, skills, and energy to another denomination or organization or whatever and we will be missing out at the wonderfulness they have to offer. Or even worse yet, the challenges of being in a faith community will completely override the benefits of being in one and turn them off completely. We should be doing everything we can to make it possible for younger leaders to participate instead of naming reasons that prohibit them. If it is challenging for those with young children, then let’s provide childcare and children’s programs. If it is about money, then let’s provide scholarships. If it’s about length of time of the assembly or meeting, then let’s change it. We have an opportunity here. It isn’t about the “old” stepping aside. It’s about the “old” making room, sharing power, and modeling grace. I promise if we do that, we will be better off for it or at the least, it will be a lot more interesting than watching a week of what just happened at this last GA, which let’s be clear was agreeing to do nothing. I agree wholeheartedly. Like everyone else, young people know when they are not included in the power equation – I certainly did which is why, back in the day, student council and the school newspaper held no appeal for me. And one of the best experiences of my life was when I left parish ministry to work in a nonprofit and suddenly had a supervisor 25 years my junior. The other realization? The world outside the Church is run by young people. It was a real shock after years of working in the Church bubble to see that not everyone is over 55. Thanks, I needed to read that. I am having the same experience, Trina, in regards to how the non-profits are dominated and run by the “young” while the church, well, not so much. I’d like to say to the “old” – we’re not asking for you to be side-lined. But to make the table larger so that more voices and leadership can be heard. The table is not just one size. It can expand, but you must allow it too. Thank you. This describes my experience of GA this year better than I ever could. I am one of the weary newly “middle”. I see nothing new, really. As a “new,” I despised, I rejected the “old’s” way of doing things, but I stayed. As a “middle,” the “old” started to look a little too familiar, but in classic Jungian fashion I recognized the despicable in me that I saw in the “old.” And I stayed. Now as an almost “old,” I despise the loss of idealism and the rise of the perfunctory in myself. Yet I stay. We use to say, “The church is one generation from extinction.” Now it seems the church is one generation from quiet resignation. I have such admiration for you, Theresa, and I hope and pray that your experience at GA does not dampen your enthusiasm for ministry and the possibilities for change in the PCUSA. God and history are on the side of the kind of change you and young adults want. Albert Camus said, “The impossible is what takes human a long time to accomplish.” As one of the “old” ones you mention, I have seen the impossible, even miraculous, take place during my 40 years in ministry. Unfortunately, change agents do not always get to experience the fruit of their labors. I continue to be involved with young people, even at my advanced age, because they are the change agents the church needs. To get discouraged at the results of GA, however, is to put too much hope and emphasis on the legislative process. As I said in my opening remarks as a candidate for moderator, the local church is disconnecting itself more and more from the actions of the GA. The kind of change you and I want will not happen because the GA commissioners decide something. It will happen when young adults, LGBT people, and others outside the church become fully involved in the life of local churches in a way in which they cannot be ignored. I say this because I believe that real change in the PCUSA will happen through local congregations. I said to the YAADs that I wanted them to keep reminding us old folks that our fights are not theirs. Most local congregations, especially small ones, are hungry for the kind of vitality that young adults bring. Please keep engaging us old Presbyterians in your engaging, dynamic, thoughtful, wise, and passionate ways. And while you’re at it, invite more of your tribe to do the same. this should be required reading for all GA commissioners-thank you! Theresa. thank you for articulating so clearly for me where you see this denomination sitting, standing, falling in this time. For a denomination that calls itself reformed, ever reforming, I believe we have lost the essence of discipleship, especially when we don’t provide a visible table that is big enough, round enough, so that our words of invitation to our young ones are matched by welcoming places right there at that table. Hitting an important nail on the head. And true, it is not a matter of age – as I approach 50, I find myself growing weary of the games. Thanks for stating this reality so clearly. Now, if it will change anyone….. Thanks so much Theresa for articulating some of my thoughts of the GA as well. Glad you’re involved with PCAN. Blessings. Keep it up, Theresa! One of the keys to the future is to expand the circle, not shrink it! “Old”, young and the middle working together is the key to vitality and to whatever the church will be. BTW: I suppose I fall into the “old” category but I hope I’m “young” in my wishes, thoughts, attitudes about the church and much else! I echo everything that Martha Brown said – describes me to a T.
Keep the faith, hope, and love alive, Theresa. Peace be with you. Thank you. I am old, but new too this church. Your feelings and the comments/encouragement that follow make be believe that in joining this church family I have made a decision that will ultimately make me happy. 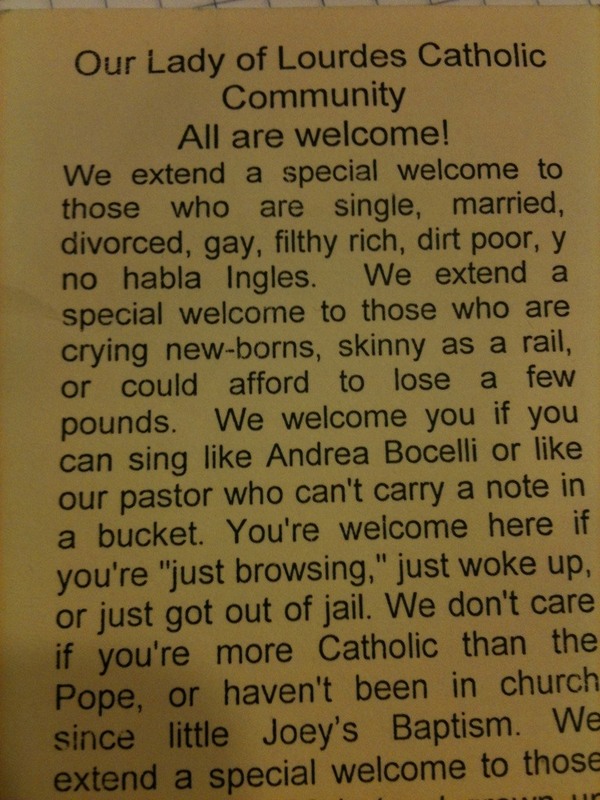 trying to find the lady of lourdes catholic catholic community bulletin you cited in the article-there are a bunch on google…love the welcome statement but which one?